A leaf-eating tortoise beetle has a symbiotic relationship with bacteria living inside its body that allows the insect to digest pectin, part of a plant’s cell other animals can’t break down. The bacterium also has a surprisingly tiny genome—much smaller than previous reports on the minimum size required for an organism not subsisting within a host cell. Two organs alongside the foregut of the beetle Cassida rubiginosa house the bacteria and appear to have no other function than to maintain these microbes. “The organs are equivalent to the liver in humans, in the sense that they contain the tools to break down and process food,” Salem says. The newly characterized bacterium has only 270,000 DNA base pairs in its genome, compared to the millions that are more typical for bacterial strains. 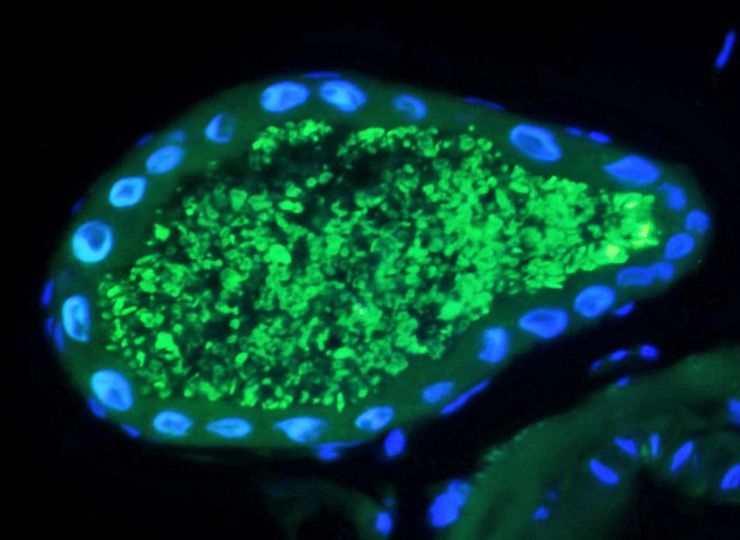 That makes its genome closer to that of intracellular bacteria and organelles than to free-living microbes. Mitochondria, for example, the organelles that regulate metabolism within cells, have 100,000 base pairs. Salem is a researcher in the lab of biologist Nicole Gerardo, an associate professor who specializes in the evolutionary ecology of insect-microbe interactions. The lab combines genomic and experimental approaches to learn how both beneficial and harmful microbes establish and maintain relationships with their hosts. A human gut holds about 10,000 species of bacteria. These microbial communities, which can be genetically characterized as microbiomes, are transferred generationally but are also dynamic and respond to environmental changes. The microbiome of an urbanite, for example, has different characteristics from that of a hunter-gatherer. Unlike humans, insects tend to have specialized feeding ecologies. They offer simple models to study symbiotic relationships between microbes and their hosts. Salem became fascinated by Cassida rubiginosa, more commonly known as the tortoise beetle, while he was a graduate student at the Max Planck Institute for Chemical Ecology in Jena, Germany. He was leafing through a 1953 edition of a book by the late Paul Buchner, a German scientist and one of the pioneers of systematic symbiosis research in insects. Buchner referenced a 1936 paper by one of his students, Hans-Jurgen Stammer, on Cassida rubiginosa. “Stammer wrote that, unlike most leaf-eating beetles that he had studied, this one had sac-like organs that he had never seen before and the organs were filled with micro-organisms,” says Salem, who looked up Stammer’s original paper in a now-obscure journal. “He didn’t have the high-powered microscopes that we have now, or genome sequencing technology, so he wasn’t able to comment on the functionality of the mysterious microbes. At that point, the idea that microbes could do anything beneficial for an animal was mushy science,” Salem says. 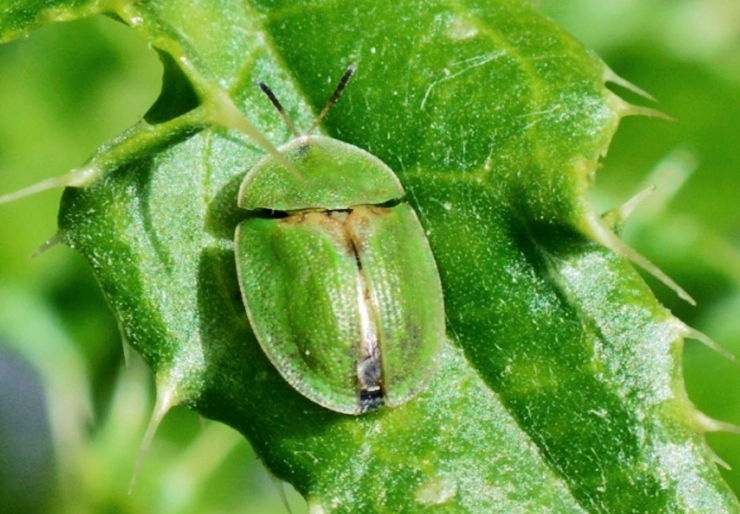 The tortoise beetle feeds on the tough, spiny leaves of the Californian thistle (Asteraceae). This prolific weed grows throughout much of the world and is difficult to control. Salem followed the trail of his curiosity to New Zealand, spending time with an agricultural researcher, Michael Cripps, who breeds the tortoise beetle as a bio-control model for thistles. “You drop 100 beetles on a thistle plant and the insects will just drain the plant metabolically until it dies,” Salem explains. As an herbivore that specializes in eating leaves, the tortoise beetle must consume large amounts of plant cell walls, made of hard-to-digest materials like pectin. One of nature’s most complex polysaccharides, pectin is a gelatinous substance that gives plant cell walls their shape and rigidity. While it was unclear how the beetle obtained needed nutrients of amino acids and vitamins from such a diet, Salem suspected that symbiotic bacteria played a role. When he joined the Gerado lab, Salem continued to study the tortoise beetle and its micro-organisms with the help of fellow postdoc Aileen Berasategui, a coauthor of the paper. They used genome sequencing technology to characterize the microorganisms as a new species of bacterium. Despite its tiny genome, the bacterium has the power to degrade pectin. 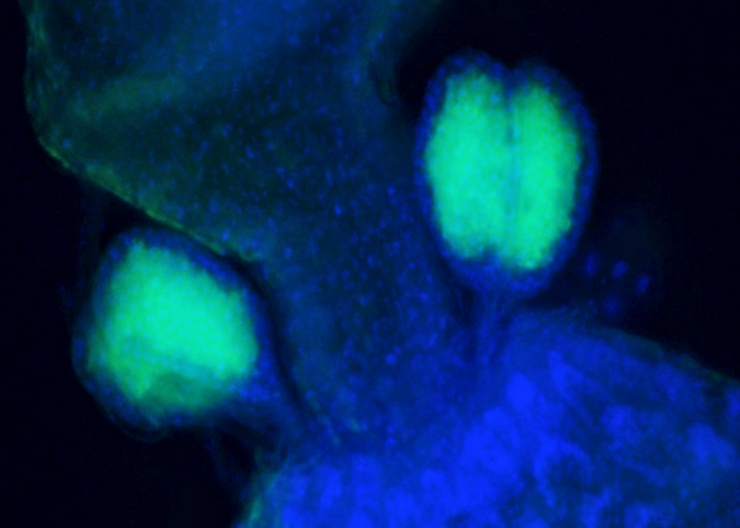 “Just as an apex predator has claws and strong mandibles to obtain the nutritional value that it needs from its prey, the bacterium has pectin-digesting genes that enable the beetle host to deconstruct a plant cell,” Salem says. After the bacterium breaks down the pectin, the beetle’s digestive system can then access all of the amino acids and vitamins within the plant’s cells for its nutrients. Salem christened the new bacterium Candidatus Stammera capleta, after Hans-Jurgen Stammer, the ecologist who first glimpsed it and wondered about it more than 80 years ago. The researchers report their findings in the journal Cell. Additional coauthors of the paper are from the Max Planck Institute for Chemical Ecology, the University of Luxembourg, the Lincoln Research Centre in New Zealand, Johannes Gutenberg University in Germany, and the National Institute for Advanced Industrial Science and Technology in Japan.